It comes from the warm, wet environment of South America. Its origins make it naturally resistant to rot, decay and insect attacks. It is Ipe (pronounced “EE-pay”) wood from Brazil. It has other interesting qualities as well. Ipe is so dense that if you drop it in a pool, it will sink. It is 8-times harder than California Redwood. It is also known as Brazilian Walnut or Iron Wood. A deck made with Ipe can last 50 years or more and still look good. Whether or not your decking material can float or sink probably doesn’t matter to you, but some of Ipe’s other qualities are very attractive to homeowners considering deck material options. In the past. Ipe popularity seems to be increasing as we’ve had more requests recently about this super durable wood. Ipe is very attractive: it has a natural reddish brown color that varies in shade and hue and has a very tight grain. In order to maintain its beautiful finish, it is typically sealed with an oil-based sealant, depending on how much weather it will experience. 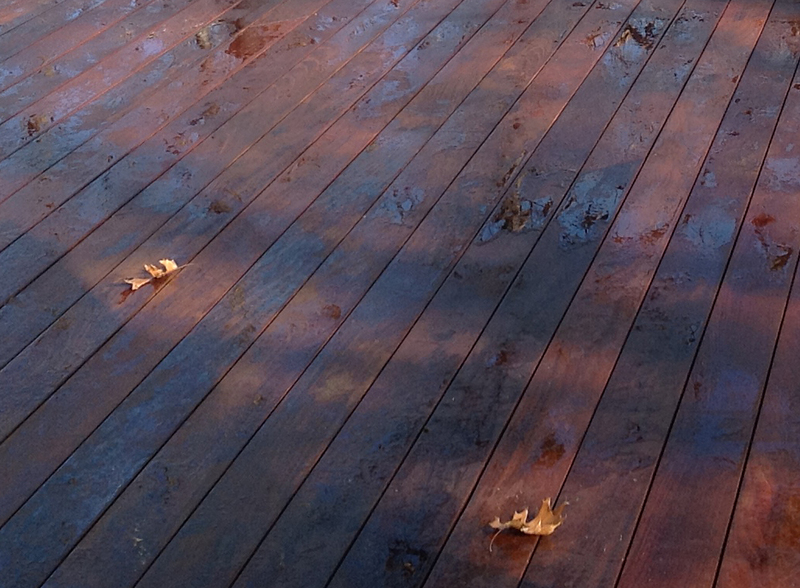 This close-up of the Lenexa KS Ipe deck shows the beautiful dark color and the color variety in the different boards. Ipe can be used in many different designs for both outdoor decks and enclosed porches. It can be used in flooring, railing, and in some cases, trim detail. Its look and style are very different from the more common North American hardwoods. It is also distinct from PVC and man made lumbers, though it rivals them in durability. The promise of a long life and good looks wins many homeowners over. There are some other things to consider when you are researching Ipe. It requires more time and skill to work with because it is so hard and dense. Costs for materials and labor will be higher with Ipe than they will with more common woods like cedar and redwood. 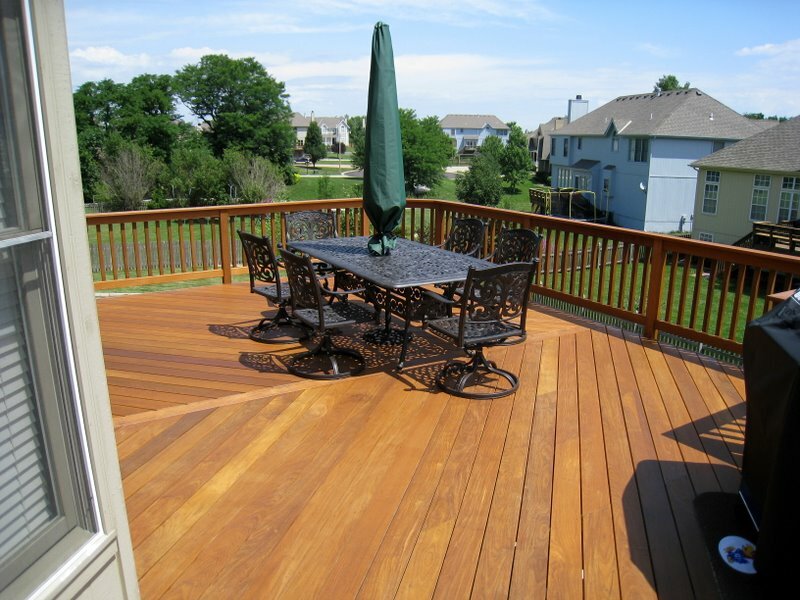 Archadeck is proud to be one of only a few experienced Ipe deck builders in Kansas City. We are familiar with Ipe and know how to make it work and use it to its best advantage. As fun as exotic wood facts are, hardness, durability, appearance, decay resistance and cost are more important to consider. After you have spent a little time exploring your options, invite us over to answer your questions and give you a free consultation. We want to help you pick the materials and design that will best suit your project. If you’re considering adding an outdoor living space to your Kansas City area home, give us a call for a free consultation at (913) 851 – 3325 or drop us an email at kansascity@archadeck.net. For more Ipe deck pictures, please visit the Ipe deck photo gallery on our website. This entry was posted in Ipe Brazilian hardwood on April 29, 2014 by archadeckkansascity.